NetSuite OneWorld Suite seamlessly handles multiple currencies, taxation rules and reporting requirements across geographies and subsidiaries, providing real-time global business management and financial consolidation in a unified, cloud-based system. Dhruvsoft provides NetSuite OneWorld licenses and NetSuite OneWorld Implementation, Support and Customization Services to clients across the world. 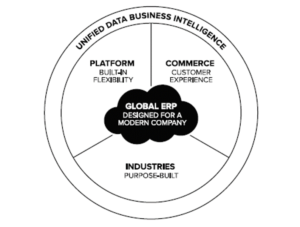 NetSuite OneWorld addresses the complex multinational and multi-company needs of mid-market organizations. Enables businesses to adjust for currency, taxation and legal compliance differences at the local level, with regional and global business consolidation and roll-up. NetSuite OneWorld allows you to conduct e-commerce around the globe with multi-language, multi-country and multi-brand web stores that all can be run and managed from a single NetSuite system. You can manage web stores worldwide-each in their location specific language and currency. NetSuite OneWorld Services Resource Planning (SRP) streamlines the complete services lifecycle from marketing to project management, service delivery, billing and revenue management and helps you to drive repeat business from existing clients. NetSuite OneWorld provides real-time visibility across your entire enterprise, enabling unprecedented access to financial, customer and business data worldwide. It provides multiple levels of consolidated reporting and enterprise-wide Key Performance Indicators (KPI’s), displayed in real time on dashboards. Contact us to buy or to know more about NetSuite OneWorld or to Hire us for NetSuite OneWorld Implementation, Support or Optimization services. Dhruvsoft is one of the leading NetSuite partner in India providing NetSuite licenses and services.